Taste test: A surprise here, we were expecting very little honey and a lot of mustard. But they actually taste like a sweet honey mustard, kind of like Wendy's honey mustard sauce or KFC's honey mustard. An OK chip, but not outstanding. They do leave some residue on your fingers. 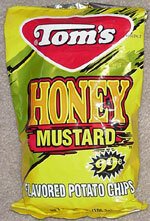 Smell test: A little mustardy, kind of a weak version of the Tom's vinegar chips.